Hello again. With our focus on giving you PTE examination information, this week we are presenting you PTE Reading Test information. If you have missed our previous blogs, we have published 4 blog topics – (1) What PTE Exam is about, (2) Speaking Skill Test Part 1, (3) Speaking Skill Test Part 2, and (4) Writing Skill Test. So lets read about what Reading Test is in PTE. Fill in the blanks reading and writing. You will be given two to three of each of ‘multiple choice single answer’ and ‘multiple choice multiple answers’ questions. 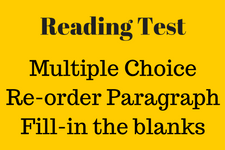 These question types require you to analyze the paragraphs and identify specific information. Each passage is about 300 words long. Most candidates find it difficult to manage time in the reading test. This is the first problem we address in our sessions. We train you to look for specific information in the shortest possible time. This is given to know whether you can follow logical and chronological sequence of events. You are given a series of boxes with a few sentences in each. You need to put them in a logical sequence. Total length of the paragraph may be about 150 words. We help you to identify the connection between paragraphs. We encourage you to practice more number of tests so that you develop the skill required to attempt this type of question. You may get 4 to 5 such questions. In this type of question, you get a passage of about 80 words with 4 to 6 blanks. You are given a few words below the passage. You have to identify the right word which completes the sentence and drag and drop it in the blank. To answer this question type, your grammar needs to be good. You need to know the words that collocate well. Therefore, we give you suggestions on improving your grammar if that is the area of improvement. Then we provide you with a list of collocations which prepare you for this question type. Last but not the least, we present to you tips on short listing the words that fit into the blanks. You get 4 to 5 such questions. You get a passage of about 80 words. The skill you need for this type of question is similar to the previous question. Improving your vocabulary to crack this question is a good idea. We have now completed the PTE Reading Test skill. Please await our next blog on listening skills of PTE Academic. Till we meet again, have a wonderful week.